You guys. You guys. I have no words for you all. You are SOUL FILLING. My mail is such a happy part of my day nowadays. Would you like some examples as to why I love my mail so much? It’s because my mailbox overfloweth with love. And rodents. And other small furry things that are almost rodents. From my friends Katie, Sherry, and Michal. Thank you. So much. Is that not the nicest ever? 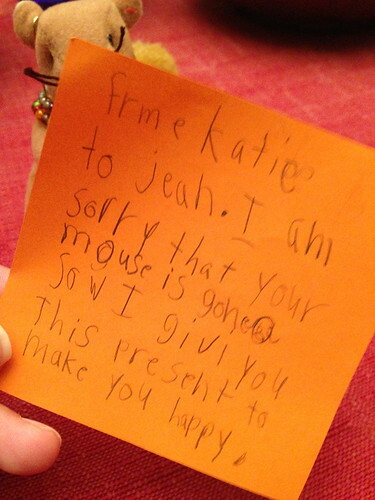 I love that kid. That otter in the middle comes from my old college chum. She sent this amazing note with it telling the story of the debate amongst strangers that took place in the store as to what animal exactly this was and whether it was, in fact, a rodent. Answers: otter and no. Nonetheless, otters are one of my favorite animals and he is small and brown and fits in perfectly as a conscientious objector to Algernon’s Army. Then there is Speedy at the end, who is really not very speedy because he is chubby and round and can’t actually move very fast. He’s like the rodent version of me. He is hilarious. Jack almost passed out laughing when he saw him. I think she is subtly referencing Algernon’s resiliency here. Do you want to know what else came in the mail today? 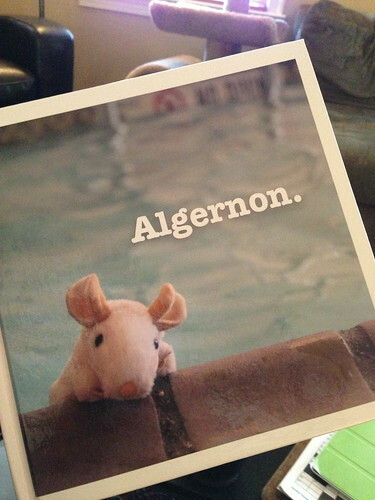 A photo book about Algernon from my beautiful friend Bec. The book includes the very first post about Algernon that I ever wrote and then photo highlights of his adventures from the past two years. 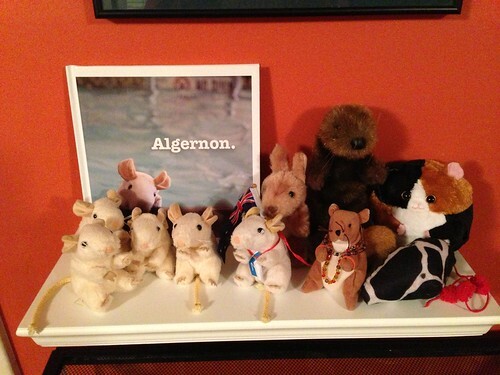 Algernon’s Army is so large that I had to dedicate a shelf to it. Because I don’t have a single unused shelf in my house, I had to buy and install a shelf just for my new little friends. I think you’ll agree that it was worth the effort. 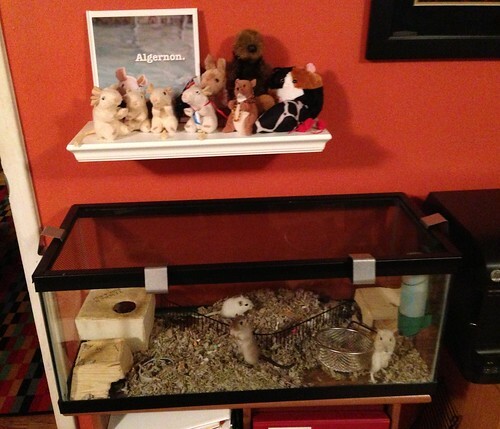 The shelf is appropriately situated over one of the gerbil tanks. I like how Jetpack and Jefferie are standing at attention here. I cannot tell you how happy it makes me to look over my left shoulder and see my shelf-o-love-and-rodents. 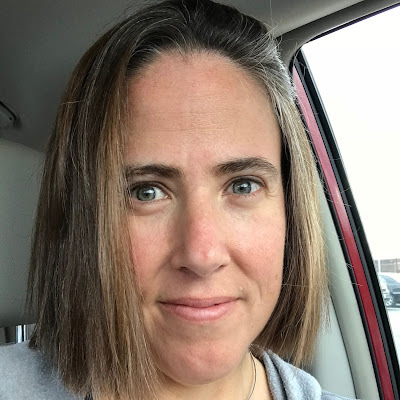 You guys are amazing. I think that is probably all of my Algernon-related news. 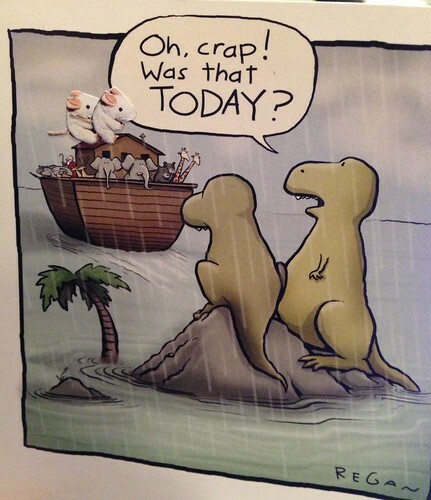 Thank you all for continuing to be so awesome. I love you guys.